One of the reasons why we like to have friends visiting us here in Istria is that it makes for a good reason to explore the region a bit more. This August, our friend Brandon visited for the third time and his wish for a day trip was: hilltop towns and truffles (and we got plenty of those in Istria). We've been wanting to visit Oprtalj in the northern part of the region ever since our Istrian friends that live abroad told us they like to spend a couple of days there in the summer, just relaxing, enjoying the views and eating truffle pasta of course. They also told us of a little abandoned, almost forgotten town of Završje, about 10 minutes drive from Oprtalj. 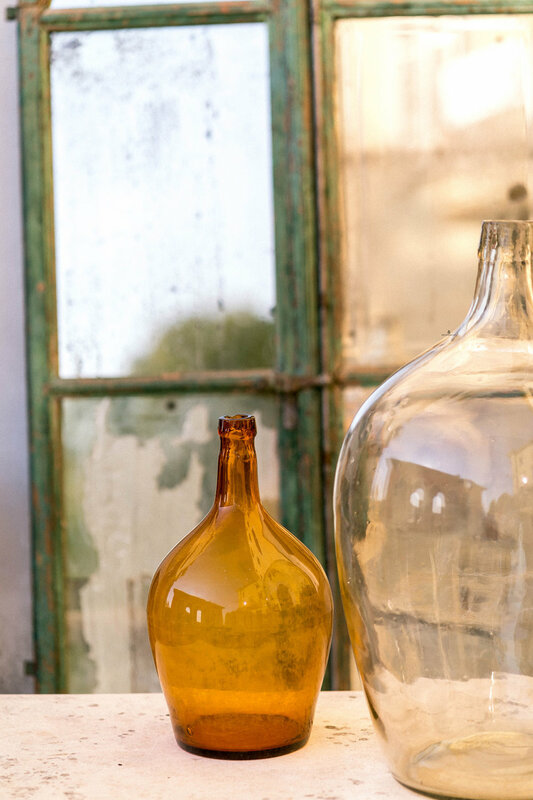 We wanted to spice things up with a visit to a winery, and we chose Vina Rossi, mostly because we liked their Nostromo gin, and wanted to get a little insight into its production. Since Brandon was there, we seized the opportunity to make another video for our YouTube channel, first in the series of our Secret Istria (Luka did a great job in filming and editing, while Brandon and I chatted and mostly giggled). We called in advance (and I recommend it for visiting any winery in Istria) to arrange the tasting, so when we came we got a tour of their cellars, an insight into the production process of the wines and distilled spirits, wine tasting, and most importantly- gin tonics spiced with local herbs, spices, and berries, that we sipped on a terrace overlooking the Mirna river valley (Mirna in Croatian means "quiet", and the valley below is indeed just that). The winery is located in the village of Bajkini, just outside Vižinada- an easy detour if you're making a day trip to Motovun and Grožnjan, cycling the Parenzana route or, like us- heading to lesser-known Oprtalj and Završje. We approached Oprtalj by the road leading from Motovun and Livade (the land of truffles), ending up on a high plateau before reaching the town- from there, a view of Motovun and Mirna valley opens up on one side, a view of Oprtalj and its vineyards on the other. Every time we make a day trip to the Istrian countryside, I end up amazed by the beauty of this little corner of the world, with those unmistakably Istrian views of the hills and valleys, hilltop towns and vineyards. 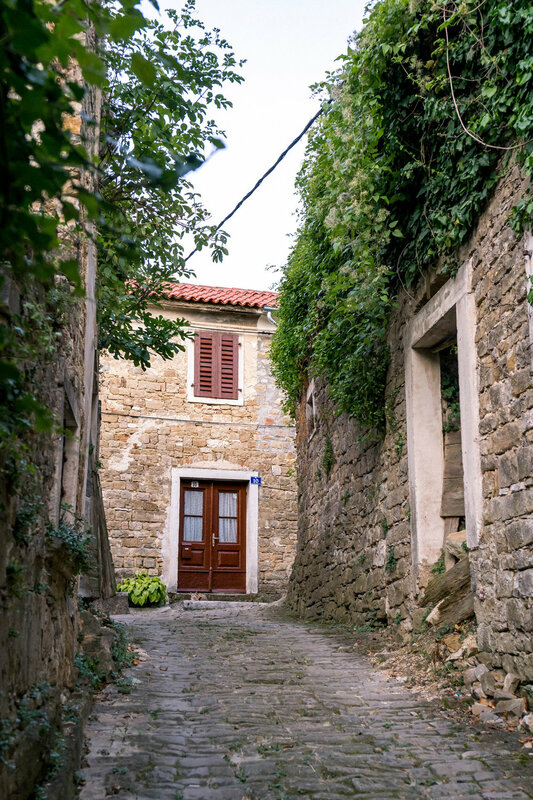 Taking a walk up and down the streets of Oprtalj (as it often happens in Istria) is like stepping back in time, or maybe even like stepping into a film set. Many houses are abandoned, that both adds to its charm and makes me curious about the times when all of these houses were inhabited- through the branches of the trees growing inside one of them I could still see, very clearly, little blue flowers painted on the walls. What kind of space did those little flowers embellish, when was this house abandoned, and why? Time appears to be standing still. Cobbled streets, vaulted passages, derelict doors and staircases, crumbled plaster, chains and padlocks on the doors guarding the mysterious interiors of the houses. A couple of kids running with their shirts off. One barking, one curious dog, an old man mowing the insides of an abandoned courtyard with a sickle, a couple of locals drinking beer on the street, a young woman from the souvenir shop idling away the time by chatting with them. Bright green wine leaves stretching over the narrow alleys, flowery bushes overflowing the old stone walls, a couple of flower pots giving up signs of life behind the doors, a line of cypresses on the road that leads up to town. A couple of wandering visitors immersing into the peaceful atmosphere. Outside the old town walls, Oprtalj is livelier. A group of kids is playing with a ball on a town square overlooking the valley and surrounding hills. Unfortunately, the square currently serves as a parking lot. A konoba our friends told us about has a perfectly shaded terrace at the end of the square, and is filled, but not overcrowded with foreign tourists. We took a look of a renovated town loggia with again, amazing view (you can find another one with amazing view in the nearby town of Motovun) and decided it was time for lunch. We sat on the terrace of Konoba Oprtalj, in the shade of huge chestnut trees, spreading like giant umbrellas over the wooden tables and benches. Oprtalj and its surroundings are known for its truffles (both black and white), and this is one of the restaurants that serve them fresh (not infused in oil, not the tasteless ones you can buy in little mason jars). We ordered two plates of ravioli with truffles (one for Brandon, one for me), a pasta with sugo (Istrian beef stew) for Luka, half a liter of house wine and one dessert to split in three. The food was good, but not as delicious as in some of our favorite Istrian restaurants- I found the sauce not as juicy and I prefer more truffles over the pasta! :) The dessert was quite good actually, a semifreddo with ricotta, walnuts, and honey. We enjoyed our lunch, especially for that shade and that view. Our last stop was Završje, and after a little detour we made trying to find an alleged waterfall that was dried up at the moment (it was August, after all), we approached the town at sunset. 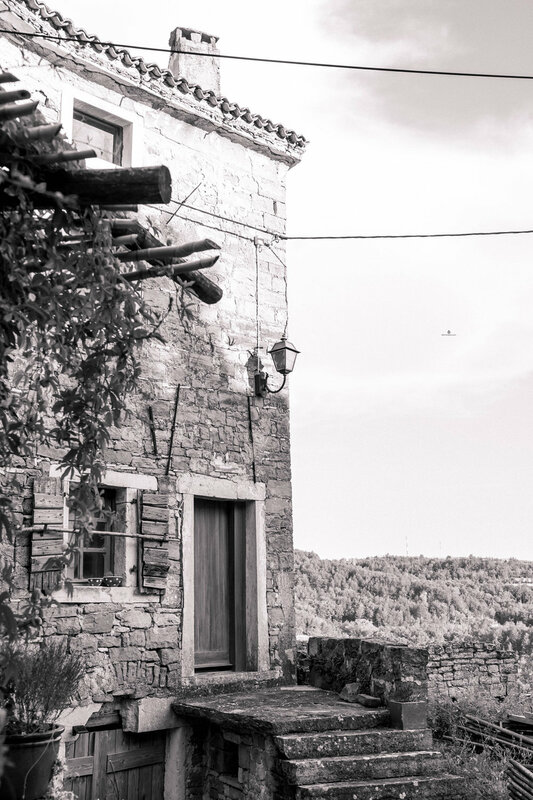 Even though Istrian hilltop towns look as the time stood still, on a day trip there, time always flies. We thought Oprtalj was quiet, but Završje was something else. Except for many cats, one cute barking dog on alert and three locals- we were completely alone. I was struck by the silence and the absence of movement, how forgotten this place was. It all looked like one day the surrounding woods will swallow the town and no one will even notice. However, it is (or at least it was once) a proper little town, with the 11-th century palace, partly preserved town walls, three churches, and a collection of beautiful stone houses (now reclaimed by nature). We could hear our own footsteps resounding over cobbled streets, and it is one of those places where you talk in low voice as if it was improper talking in normal frequency. The silence that enveloped us, heavy skies above, the sound of a lone mattock used by an older man working in his garden, a flock of birds fluttering above us created an ominous atmosphere, I couldn't help but feel it. We tried to catch the atmosphere on film, and for the first time I wrote a post while Luka made a video at the same time- you can watch the latter one in the link at the bottom of the post! As I mentioned before, this video will be the first in our series "The Mint Story's Secret Istria" where we'll explore the lesser known parts of Istria, hilltop towns we love so much, our favorite restaurants, agrotourism, natural wonders, hidden art treasures, and maybe even some interesting people (if anyone agrees to be caught on film). I hope you'll join in (and as always, let me know what you think).